Don’t you just want to eat all that right this second? Please excuse me while I hide out with my lemon monkey bread and rewatch every Portlandia episode for the 100th time. Melissa from No. 2 Pencil is the culinary genius behind this scrumptious dessert. It takes only forty-five minutes total to prepare and cook! Once it’s done, set it on a DIY cake stand and serve to your guests (shh, let them think you slaved away all day on it). Keep the monkey bread coming and try Jaime’s heavenly Chai Monkey Bread. Melissa’s Pancake Pops and Slow Cooker Chicken are also sure to please a party of hungry guests. If you feel like this treat needs an extra little something you could always put a bird on it. Monkey bread is a family favorite. My kiddos love it and I’m sure it has a lot to do with the name. I mean, monkey bread is just fun to say. Last weekend we did a twist on traditional monkey bread, and made Lemon Monkey Bread. It is absolutely amazing! The warm flavors of brown sugar and butter combine with the bright citrus zest perfectly. Top it with a lemon glaze for even more yummy citrus flavor. 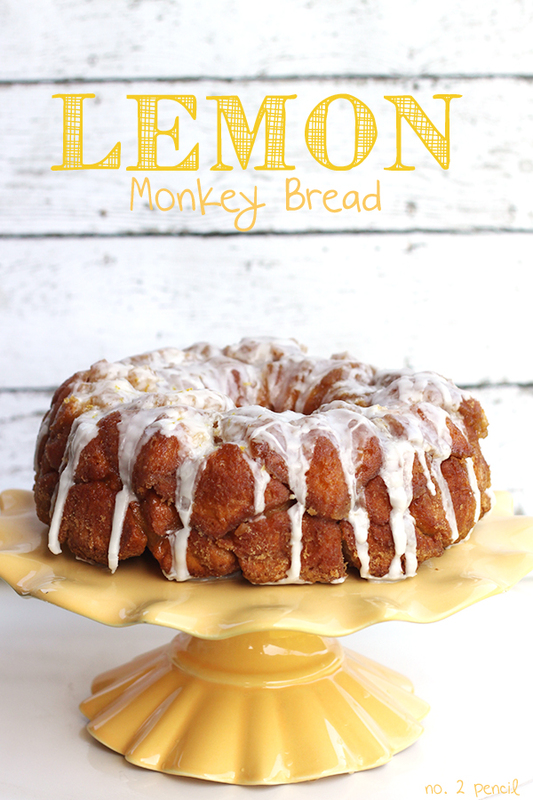 Lemon Monkey Bread is a strong contender against my Orange Sweet Rolls as a new brunch favorite in our house! For this recipe, I used biscuit dough as a shortcut. But you can certainly go homemade. Just substitute a homemade yeast dough, and keep the rest of the ingredients the same. A fresh, lemony version of monkey bread. Perfect for brunch! -Spray inside of Bundt or fluted pan with non stick cooking spray, or brush with melted butter. -Combine lemon zest, sugar and brown sugar in a large plastic baggie. -Quarter biscuit dough and coat in melted butter. -Add dough pieces to plastic baggie and shake to coat. -Place dough pieces in Bundt pan and bake for about 30 minutes. 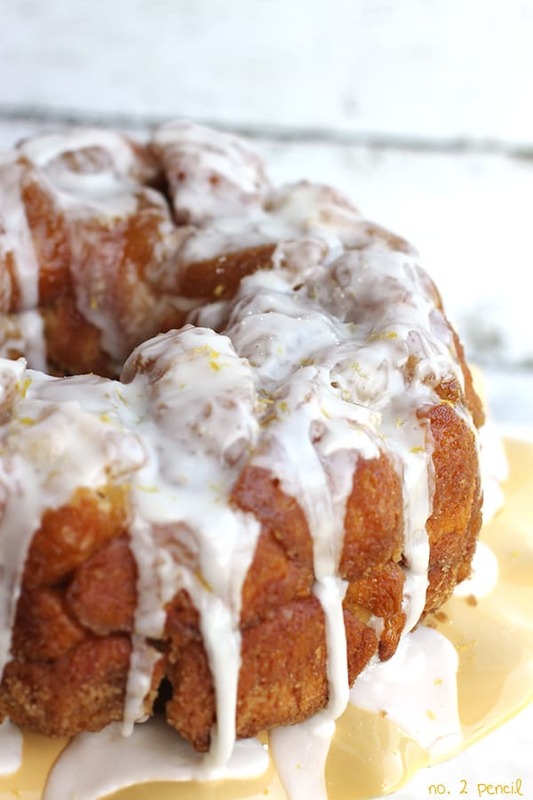 -While monkey bread is baking, prepare lemon glaze. -Combine powdered sugar and 6 – 8 tablespoons of freshly squeezed lemon juice. Adjust as needed for a pourable consistency. -Remove monkey bread from oven and very carefully invert onto a serving plate or cake stand. -The monkey bread will be very hot, so use oven mits and be very careful! -You will need to turn out the monkey bread while it is still hot, or it will stick to the inside of the pan. -Drizzle with lemon glaze and serve warm. Has anyone else tried this recipe? I’ve been dying to cook it and I finally had the chance tonight. Everything seemed fine until I took it out of the oven at 30 minutes. I noticed that the dough underneat the top layer wasn’t cooked yet, so I stuck it back in the oven for 10 more minutes. Now, the top was all crispy and brown, but the dough underneat still wasn’t cooked. I used an angel food cake pan, so I turned it out and all the pieces fell apart (I had to put it in a bowl). Not only that, but a ton of liquidy sugar seeped out of the bottom. So, maybe it just had too much liquid? The flavors were undeniably brilliant, but I wish it had turned out 🙁 Any tips? This looks great. Will definitely try it out.